Having grabbed our attention with the original mould-breaking Single Lens Translucent cameras (SLTs) the Sony Alpha a55 and Sony Alpha a33, Sony has gone on to produce further high-performance models that are proving to be increasingly capable of taking on the mighty DSLR. Incorporating Sony's innovative SLT design - which features a semi-transparent mirror in place of the DSLR's traditional mirrorbox arrangement - the new Sony Alpha a57 boasts a number of tweaks and upgrades over its predecessors that certainly look good on paper, and could potentially take Sony's DSLT range one step closer towards knocking its DSLR rivals off their respective pedestals. Built around a superb 16MP APS-C sized CMOS sensor, the Sony Alpha a57 features a DSLR-esque design similar to that of the enthusiast-level Sony Alpha a65 and sports a raft of high-spec features to boot. With Full HD 1080p movie recording capability, stereo sound, SteadyShot INSIDE and a class-leading 12fps continuous burst mode, we expect that the DSLR manufacturers of the Sony Alpha a57's closest competitors will certainly be watching closely to see how this new model fares in the real world, and what move Sony will make next. 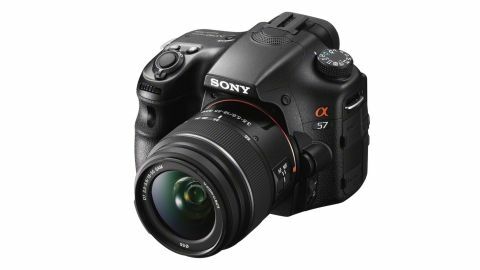 The Sony Alpha a57's 16.1MP Exmor R CMOS sensor is borrowed from one of Sony's popular compact system cameras (CSCs): the Sony NEX-5N. While this may seemingly offer no real advantage over the same resolution, older Sony a55, Sony's decision to pair the swapped sensor with its latest generation BIONZ processor looks to be promising in terms of the improved image quality that may be possible. We'll share our verdict on this later. Sony's Translucent Mirror Technology (TMT) offers a number of benefits, not least fast, full-time Phase Detection AF, which enables SLT cameras to deliver a very responsive performance, plus impressive features such as the Sony Alpha a57's class-leading 12fps continuous burst mode, for instance. You also get Full HD (1080p) movie recording with stereo sound with the Sony Alpha a57, plus a high-resolution, 921,000-dot, 3-inch LCD screen, which can be flipped out from the back panel and swivelled any way you want, to enable easy composition when shooting subjects at odd angles. The Sony Alpha a57 retains the Sony Alpha a55's 15-point AF module, although Sony stresses that improvements have been made to the new camera's Object Tracking AF for improved consistency and accuracy. Sticking with the subject of action photography, the Sony Alpha a57 outguns its predecessor when it comes to sequential image capture, clocking up a standard rate of 8fps at full resolution, 10fps in Continuous Priority AE (full resolution frames, but the aperture remains constant) or a class-leading 12fps in the camera's top-whack continuous burst mode. The latter employs Sony's Tele-Zoom feature to capture a reduced resolution 1.4x crop of the centre of the frame, enabling (still very good quality) JPEGs of moving subjects to be recorded at high speed. The Sony Alpha a57 has - for some reason - lost the Sony Alpha a55's GPS module in the upgrade. While this may be a deal-breaker for some globe-trotting photographers, there is some benefit to be noted with the omission of this feature, in as much as the Sony Alpha a57's battery life is extended to around 600 shots per charge when using the LCD. A handful of new features, including Auto Portrait Framing, Sony's By Pixel Super Resolution Technology and Clear Image Zoom also make their debut with the Sony Alpha a57, priced at £700 in the UK or $800 in the US, with an 18-55mm kit lens. More on how these perform shortly.